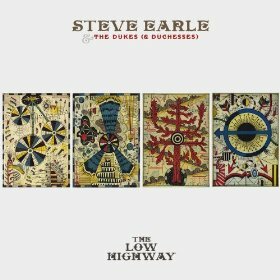 Steve Earle’s rangy vocal and solo percussive acoustic starts the first track, “The Low Highway,” on his album of the same name. Then things get nice and rough with an electric drive on “Calico County.” The drums pop, the bass rolls and the lyrics are nasty-fast (about meth actually) and there is just the right amount of tight echo and nasty lead. Wow, what a great tune! There’s softness to “Burnin It Down,” at least to the music – Earle’s lyrics never really give you an easy pass. This is territory Springsteen tries with his too-often country twang, but never reaches. For me, it’s when Earle and his band are rangy and electric, like on “Calico,” and also with Earle singing a duet with his wife, Alison Moorer, and Eleanor Whitmore’s violin playing on the biting “That All You Got?” or in the piano-led, loose snare drum rush of “Pocket Full Of Rain” (another great tune with a truly unique production). What’s really great here is that with each of these 12 tunes, you get a nice, slightly different take/production style/vibe on each, but they all feel like they connect somehow. “Invisible” sees the full realization of that alternative country label that Earle has been saddled with from his rebel beginnings to his 15th album. It’s a great tune, the height of expert songwriting; just another great song from this collection that sounds as much Jennings as Pearl Jam. If you’re into solid songwriting and a blistering, tight band, then you’ve got to get your ears down on The Low Highway.